The premium headphone maker 1MORE has launched a dual driver In-Ear headphones in India with price tag Rs.4499. 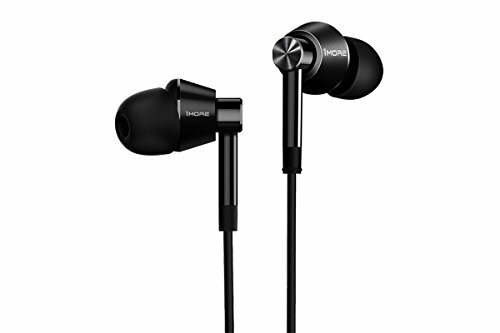 The new 1More dual driver In-Ear headphones come in jet black colour and it is available on Amazon and Flipkart. The 1more dual driver headphones offer superior sound using two drivers, one balanced armature with a separate grapheme dynamic driver. Together these dual drivers deliver amazing audio quality. These headphones are tuned by Grammy Award winner sound engineer Luca Bignardi. This ensures that its sound quality is well balanced. 1MORE further explains that the dual driver headphones come with 20 Hz – 40,000 Hz Frequency Range. Which indicates that the headphone will offer deep bass sound. It also has an impedance of 32Ω and is sensitive up to 98dB. On the design front, these 1More dual driver In-Ear headphones look very stylish and premium with aluminium alloy body and KEVLAR CORE Cable. The 1More says that the surfaces are sandblasted and textured for aesthetic appeal and fingerprint resistance. The cable length is 1.25m, which is the ideal size. Using 3.5mm golden plated connector of these headphones, you can listen to your music on a smartphone, laptop, and any other media devices. According to 1more, these headphones are specially designed to fit comfortably, with the natural curve of your ears. Due to the perfect fitting, it will also help in noise reduction and Bass effect. It also comes with the microphone and multifunctional remote. You can control volume, select songs, and take calls using this remote. 1More also provide a 1-year warranty with this dual drivers headphones.